There is a small company called Smokey Mountain Tours that will take groups of no more than eight people around the slums. 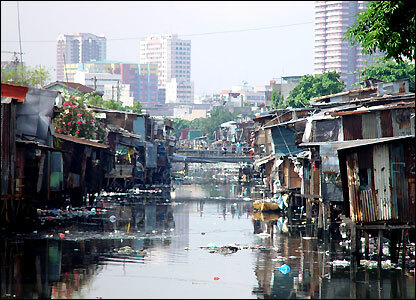 Some of you may remember that we toured the slums of Mumbai and survived and we assumed that Manila would be a similar experience. It isn’t. It is worse. Much worse. The tour is run in a similar way to the tour of the Mumbai slums with the profits going to help the inhabitants of the slums. We are told to wear closed shoes, preferably made of rubber (an ominous sign) and not to take photos as that is seen as too intrusive. I do manage to take a few quick shots. We meet at 9 am. There are seven of us. A charming 25 year old Filipino man and his German girlfriend arrive as we do, but then we have to wait for a family of three Australians. When they do arrive they enter through the door one at a time which is the only way they could get through any doorway. They are enormous and just getting to the meeting point seems to have been too much for them. Their faces are bright red and they are sweating profusely. Each one is carrying an enormous energy drink, which is clearly having no effect. They immediately collapse on to chairs which disappear under their enormous posteriors. Our guide is a petite and rather butch Filipina called Tessie who is on the wrong side of 40, but it is impossible to tell by how much. She seems unable to take in the reality of the Australians. Tessie tells us she will be taking us to two slums. She explains that it is not safe for anyone to walk these slums on their own.. The young Filipino who lives in Manila, says he would never dare to come into these areas. But the Slum Tours are carefully planned and Tessie tells us not to worry because there will be a strong police presence. The tour takes three hours and we never see one policeman. But we never feel unsafe either. And this is typhoon country. 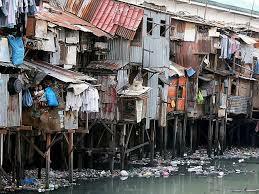 When we look inside the shanties they are just one small room per family, often with nothing in it. Some have a bare light bulb hanging from the ceiling, others have a cooking ring. The more luxurious rooms have an old plastic chair or perhaps a blanket. The one thing they all have is a large family, often of three generations living there. There is no running water and no toilets. Water can be purchased in bottles provided they have the pesos to buy it with. The river is their toilet. Just as we are thinking that it couldn’t get any worse than this, we are proved wrong. We approach a bridge crossing the river. It is a low bridge with only three or four feet between it and the water. Tessie tells us people are living under the bridge. We can’t believe what we are seeing. There are actually shanties built between the water and the underside of the bridge. It is impossible to stand up inside these homes and we can see people lying on the floor peering out at us through gaps in the cardboard walls. Walking through the slum it reminds me of the nursery rhyme “There was an old woman who lived in a shoe, she had so many children she didn’t know what to do”. There are children everywhere, peering out of every nook and cranny, at every level. They wave and shout “ hello” and giggle. They lean out of the tiny “windows”, peer round doors, wave out of cracks in the cardboard walls, or merely hide behind their mothers legs. They are in various stages of dress or undress. Some of the little ones are naked, but for the most part they are clean. The adults all seem to be in their late teens, or twenties. Each one seems to have a gaggle of children hanging round them. We rarely see anyone who could be called old. We learn that one third of the Filipino population is under 15 years old, with the population expected to double from 100 to 200 million within 30 years. 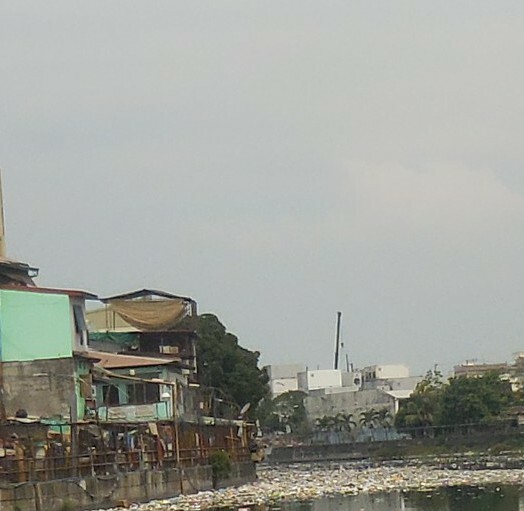 Some of the trash can be collected and recycled for a few pesos. Everyone tries to find something that can float – it can be a wooden carton, an old fridge with no door, a metal pan, whatever they can find. If they can fit inside the container then they paddle out into the river and haul in the trash. If they can’t they swim pulling the container behind them. As we contemplate how people can survive in these conditions. Tessie gathers us together and tells us we will be going on to the second slum. The drive takes us fifteen minutes and we have to wait another five for the Australians to arrive. The mother looks as if she is about to have a heart attack. They are all gulping down bottles of water in an attempt to lower their body temperature to something near normal. Before entering this slum Tessie gathers us on the sidewalk and warns us that what we are about to see is worse than what we have just seen. She asks us to prepare ourselves and to try and not look shocked at how the people are living……..
Did the tour come complete with antibiotics my dear? And you are doing this because____________________? Thanks Janet – will do !